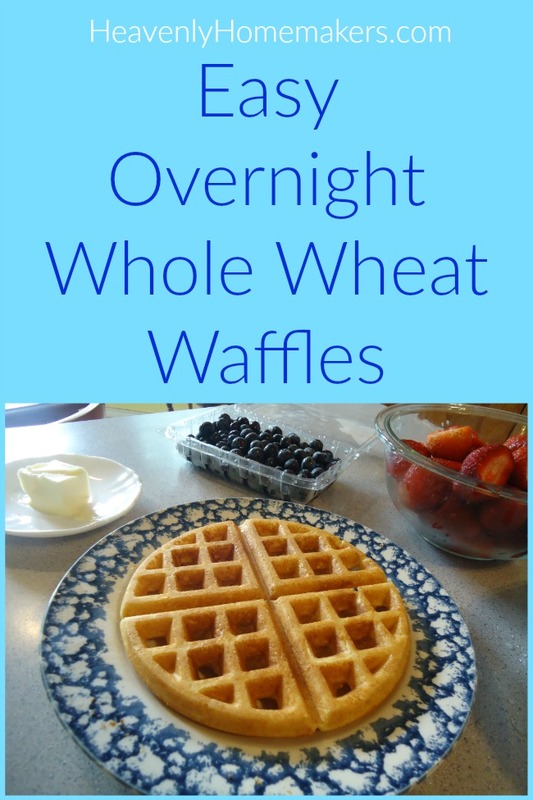 What if you could mix up a yummy waffle batter before you go to bed at night, then stumble into the kitchen in the morning to cook just as many waffles as you need – with little effort? Are you telling me that you don’t stumble into the kitchen in the mornings? That you’re a bouncer? A springer? That you wake up like Tigger? I am so happy for you. For the rest of us stumblers, we can use this recipe to wake up slowly but still have breakfast on the table in a very short amount of time. The measuring and mixing (and the thinking and the reading of recipes) will have been done the night before. You can have your waffle iron set out and ready so that all you have to do is plug it in, turn it on, and wait for it to heat. For that matter, you might consider prepping berries and whipped cream the night before because a waffle with syrup is good, but a waffle with berries and whipped cream is even better. That fascinating story was my way of telling you that while I did do some tweaking of this recipe to use ingredients I prefer, I give all the credit to my Aunt Claudia for providing the genius behind it so that you and I can be morning stumblers. These waffles are delicious! Dissolve yeast in warm water and set aside. Heat milk to just warm. Bake in a waffle iron. See the bubbly batter you’ll wake up to in the morning? No need for you to be bubbly. You get to stumble. The batter will be bubbly enough to make up for your inability to be bubbly in the morning. You might find it is enough to bring a slight smile to a half-awake face. While we like fruity syrups, we typically enjoy fresh (raw) berries on our waffles. Fresh strawberries with whipped cream is our favorite waffle topping. So amazing! Have you ever tried a mix-the-waffle-batter-the-night-before idea? I love this and plan to make it a staple at our house to save time (and brain) in the mornings! I love whole wheat pancakes. I haven’t tried them as waffles though. I have never tried a yeast batter either. Look delicious! I’ll have to try this recipe for pancakes, too! Ah, yes! I prefer whole milk, but any milk will do! 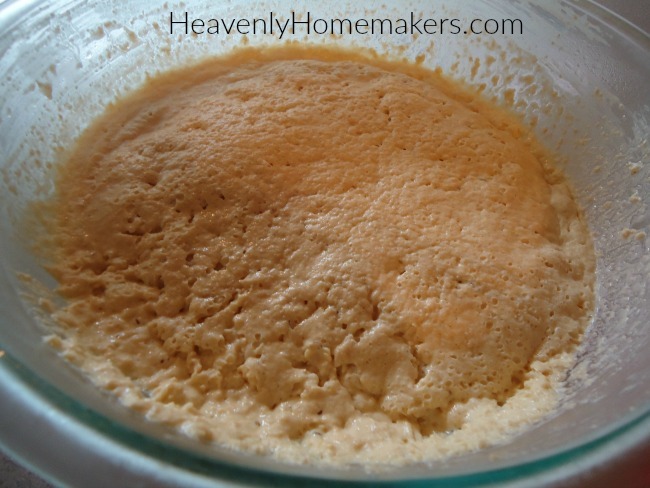 I haven’t tried a yeast batter, but makes me wonder if I could sub some sourdough starter with the same effect? Ever try that? Sourdough waffles are delicious! Just had some yesterday, in fact! It’s a fabulous way to use ‘left-over’ starter. These look so good! I couldn’t find a button to pin the recipe…is it pinnable? to Cathy B……yes it is pinnable….there is the red button with the white P for Pinterest at the end of the blog post. Click on that! sorry to post twice but just realized i needed to reply to the poster!! To Cathy B……yes it is pinnable….there is the red button with the white P for Pinterest at the end of the blog post. Click on that! Hmmm…maybe something is wrong on my end, but I don’t see any button to click on. You’ll have to click on the title of this post first, then scroll down and you should find the “pin” button. I haven’t figured out a way for it to show up without first clicking on the post title. Sorry for the confusion! There is something so special to have a recipe written in a loved one’s handwriting. I love all the recipes written by my mom and grandma! 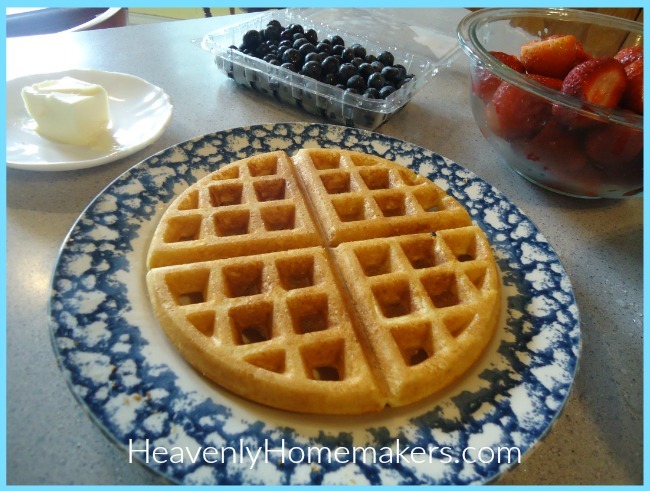 This sounds good, and your waffles look so pretty….what kind of waffle maker do you have ? I purchased one and brought it home and used it once and returned it….I was not happy with it at all….. I thought I read in one of your blogs that you can’t use soft white wheat with yeast. Would you clarify. I am going to make these. Wow, you make such a great point that I hadn’t thought of! I think the yeast in this works because it’s not a bread that needs to rise significantly. I use soft wheat in these and don’t have a problem. Interesting! Wow, super bummer!! I wonder if it was a difference in varieties of wheat?? Sounds like they needed more liquid, but I’m not sure why? Phooey! I’m wondering if the batter can be left longer than just over night?